Hello Over The Big Moon readers! I am excited to be here for my first time as a contributor for Pam and Lisa! My name is Amanda and I blog alongside my husband, Spencer, over at The Contractor Chronicles. We love to share our love of tools, our projects and stories of our house remodel. 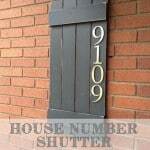 Today I wanted to share a fun and simple project anyone can make for their home – a shutter with your house number! I started by buying a couple of 1x4x8 at Home Depot and cut them down using my Ryobi miter saw. You will need (4) four pieces cut at 30″ and (2) two at 14.5″. … then I used my Ryobi Airstrike Nail Gun and nailed the cross piece into each of the longer pieces. I nailed it in at least twice on each board – sometimes I felt I needed one more nail! And then the building was done!! At first I decided that I wanted to stain it cherry, so I did but then I changed my mind and decided to paint it instead! I used DecoArt Chalk Paint in Relic. When the paint was dry I used my cornercat and sanded it down a bit to rough it up. I then used the cream wax to protect the whole piece. Since I knew it was going outside, I used a couple coats to protect it against the elements. … and screwed them on. I flipped my shutter over and screwed in two screws a few inches apart. Make sure you do this over the cross board so you don’t screw through the front of your shutter. I wrapped wire inbetween the screws and then I tightened the screws up. Now it’s ready to hang up. Last fall my husband drilled some anchors into our brick so I simply hung it up on the anchor that was already by our front door. I love it!! It is rustic and darling perfect for the space! Thanks so much for having me today and please stop by and say hello and see what other projects we have been working on! You can also follow us here on our social media as I am always showing sneak peeks at the projects we are working on! Hi there, love this idea. Especially because I want to make shutters for the windows. You day the materials are 1x4x8. What material are you using? Pine, poplar, maple, cedar? This is such a cute idea!!! Thanks Amber! I so need to do this. The house numbers on my house are almost impossible to see. Love that you can customize the color of the shutters to match your house. So cute!